The Turkish energy minister confirmed that oil was flowing again through the Kirkuk-Ceyhan pipeline from northern Iraq following an attack on the transit network. The separatist Kurdistan Workers' Party has claimed responsibility for similar attacks in the past, though Ankara was reluctant to point fingers for the latest incident. Though the southern Turkish provinces have experienced violence since the 1980s, the latest attack may be a sign of the growing frustration with the disputes pitting the central government in Iraq against the semiautonomous Kurdistan Regional Government. "Oil flow is continuing without problems through the pipeline," said Turkish Energy Minister Taner Yildiz in a statement Monday. The pipeline was attacked last weekend and officials in Ankara said the cause of the incident was unclear. One of the legs of the twin pipeline was damaged, however. The pipeline has been the target of frequent insurgent attacks, while output from the disputed origin city of Kirkuk falls nearly 70 percent from its 2011 high of 900,000 bpd. Kirkuk is the center of ongoing disputes between the KRG and the central government in Baghdad. Last week, the KRG published an open letter complaining of an "illegal and unconstitutional plan" to let British supermajor BP start work to enhance recovery at some of the depleted oil fields in Kirkuk. The KRG added that the central government was making "threatening noises" by advocating oil work in the disputed city. Genel Energy, a company based in Turkey, decided in November to cut back on oil exports from the Kurdish north in response to what it said was uncertainty regarding payments from Baghdad to the KRG. Genel, however, said that production has since increased, setting a historic milestone Jan. 4 with 109,000 barrels of oil per day from its Taq Taq oil field. Tony Hayward, the company's chief executive officer, said in a statement that oil exports to Turkey had resumed "in accordance with the authority granted to us by the Kurdistan Regional Government" and not because of any decision from Baghdad. Iraqi Oil Minister Abdul Kareem Luaibi had said Baghdad would sue any company exporting oil from the KRG and cut the regional government off from its share of the federal budget in response to political tensions. When tensions erupted between the Kurdish Peshmerga force and the military last year, the U.S. State Department suggested national unity was at stake should the situation escalate. The attack on the pipeline follows last week's suicide bombing near a Kurdish political office in Kirkuk that left at least 10 people dead. Further north, in Mosul, a demonstrator set himself on fire during Sunni-led protests against the government of the Shiite prime minister. A self-immolation in a central market in Tunisia in late December 2010 set of a string of events dubbed the Arab Spring and the latest incident in Mosul suggests Iraq may face similar challenges ahead. 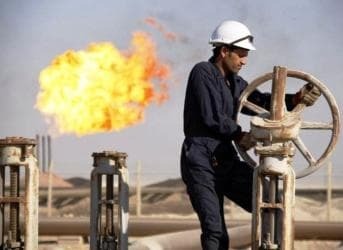 "The mismanagement of oil and gas resources by the federal authority and its lack of respect for the constitution and the many agreements it has signed, has cost Iraq not just billions of dollars of potential revenue but also myriad opportunities for national reconciliation," the KRG's statement read. "Iraq really cannot afford to sustain these losses for much longer."